What Helps Irritable Bowel Syndrome? Irritable bowel syndrome, or IBS, is a condition that leads to digestive problems such as constipation, diarrhea, or both on alternating occasions. Also, the patient may suffer cramping and abdominal pain. Doctors may treat IBS in several ways. One is to change the patient's diet, as that might bring about IBS symptoms. The patient might be advised to avoid fatty foods, caffeine, or alcohol. He might be encouraged to eat whole grain foods as well as fruits and vegetables. The patient might be treated for anxiety or stress, which might also affect IBS. Some doctors recommend medication for diarrhea and constipation. They might prescribe medication, such as Viberzi for IBS-D (diarrhea), or alosetron to slow down the colon. 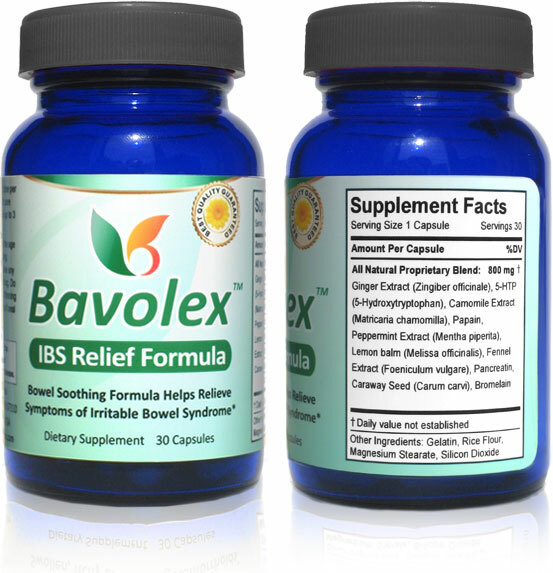 Many people prefer natural remedies that may help IBS such as Bavolex IBS Relief. In the U.S., around 15% of the people have experienced IBS. Young adults experience this first. There is 50% more women than men having this issue. IBS is often connected with nervous tension. Stomach pain is a problem for people who have IBS but it does not cause cancer or organ damage. The person struggling with IBS may get depression or hemorrhoids if the condition doesn't get better fast. According to research, there may be a connection between a neurological issue and IBS. Signals are sent between the brain and intestines. If you are under stress your brain fires either too few signals or too many to intestine muscles. This problem causes the intestine muscles to move food through the intestines too slowly or too quickly. Because of the condition, diarrhea and painful cramps or bloating and constipation will occur. IBS is strongly associated with stress, sleep problems, and anxiety. Individuals most probably go for OTC drugs which fix constipation or diarrhea but only temporarily. The relief you may feel isn't long term. It's impossible to address the real problem using such medications. With IBS being linked to stress and anxiety, the experts have a reason to suggest meds to manage anxiety. There are individuals who become drug dependent on these drugs even after the IBS is gone. Ensure you know what synthetic materials are in the drug, so you know what drawbacks you get from taking them. If you use Bavolex diligently and follow the tips in our eBook, you should notice a significant improvement within several days. A small percentage of our customers do not respond to our product, for this case we offer 60 days full money back guarantee. Our promise is simple: If you don't see great improvement, we do not want your money! Manufacturing safe products is our number one priority. Bavolex™ contains only natural ingredients from plants and herbs that are considered safe. Although numerous customers use Bavolex each day since 2009, no adverse side effects have been reported. As with many other products we recommend that you don't use Bavolex products while nursing or pregnant because the effects on fetus have not been tested. You should not take Bavolex if you are using blood thinning medication or antidepressants. 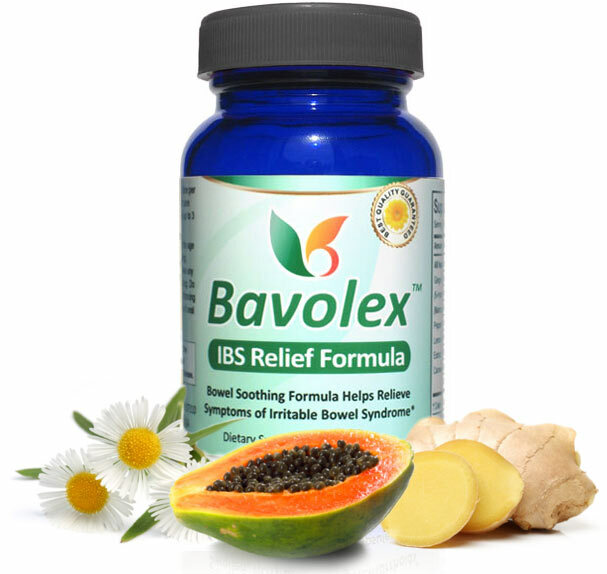 "Bavolex IBS Relief Formula is a dietary supplement formulated with enzymes and natural extracts to help reduce symptoms of Irritable Bowel Syndrome. 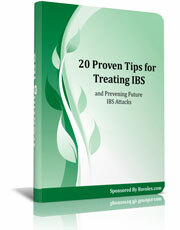 *"
In this eBook, you'll learn 20 helpful tips to get rid of Irritable Bowel Syndrome attacks . These tips cover ways to prevent an IBS attack, diet, and stress reduction. This valuable eBook comes as a bonus when you order Bavolex today. A priceless information for people who want to stop this painful inconvenience right now. Natural irritable Bowel Syndrome remedy Improve Digestion Bavolex supplement uses all-natural ingredients such as peppermint, chamomile, fennel, ginger and lemon balm, to name a few, for natural IBS relief.